“How do you know?” asks the hen. “It hit me on the head! I need to tell the Lion!” implores Chicken Little. The hen joins Chicken Little as they run towards to Lion’s Den. Along the way, they meet a duck, Chicken Little tells the story and the duck joins Chicken Little and the hen rushing towards the Lion’s Den. If you’ve been around any form of online marketing for any length of time, you’ll know that the sky is always falling when it comes to SEO. Google makes a change, the Chicken Littles get hit on the head with an acorn, they cry that the sky is falling, a bunch of sheep follow them and eventually some fox offers to show them the way to safety before eating them. Like clockwork, this cycle repeats itself every 18 to 24 months without fail. The most recent example is happening right now. If you ask Google a pretty simple question, it will answer you without showing any search results or ads. Google has said this saves them on bandwidth and load times delivering end users a better experience. I agree with them, this is a better result for me. 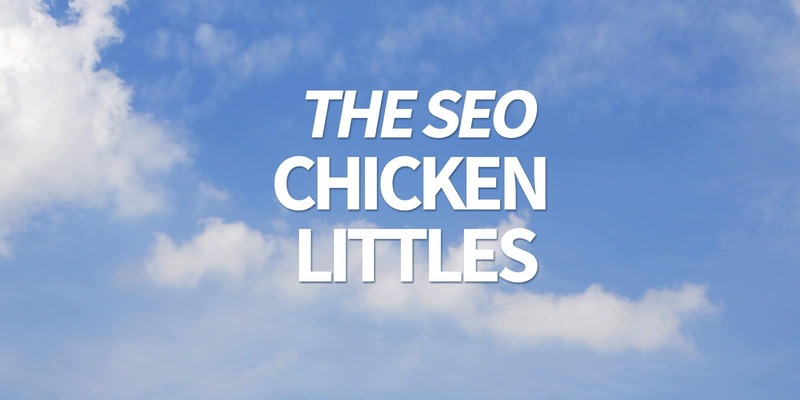 The SEO Chicken Littles are out in force. This is the end of the world apparently. It is now only a matter of time before Google only shows the results they want for things like travel information and Google Shopping results, relegating all results to an afterthought. I’ve even heard one refer to it as “Answerpocalypse”. But you’re lucky! You’re going to get a front-row seat for the foxes to take everyone following these people to their den and eat them for dinner. It will be some scammy, hype-driven nonsense – my pick is Messenger bots, but I’m sure funnels and social media will get a jersey as well. The SEO wonks who are reporting on this have to hype it up because SEO as a field has become boring. You can only talk about “voice search” for so much and Google’s algorithm changes are now a bit more subtle. Plus, the whole “Mobile First” and “SSL Priority” changes were a bit overblown, so they need to talk about something more tangible this time. The foxes though, they’re licking their chops. They’ve just hopped off the crypto pimp train having convinced people to buy digital serial numbers at overinflated prices by pretending that it was money, so they now need something new to pollute. Nothing creates an opportunity to sell the make-believe future like misinterpreting a Google change to pronounce SEO’s impending death. Grab some popcorn and brace yourselves. You’ve been warned.